America has a long history of concerns about the corruption of youth (a concern that today seems greatly diminished but by no means absent). The anti-comic book crusade of Dr. Wertham and others that ultimately led to the creation of the Comic Code is one example of such a concern but it is by no means the only one. Another object of worry was the pinball machine. Pinball was not a harmless way to pass the time, at least not to the cultural powers of the day. It was, gasp, a form of gambling. Not only could you win free games, but winning clearly depended on nothing more than luck. So concerned were communities of the day that pinball machines were banned in many places across the country, including New York City. I said get that infernal thing out of my store! There’s a school across the street … I won’t have those kids losing their lunch money!! Unfortunately the owner’s arguments are overruled by a thug’s fist. Simon and Kirby show that the gang is not limited to pushing pinball machines but they are also involved in running a gambling house. When the public objects to all the gambling a detective uses the pinball connection to trace the gang to their bigger operations. Thus Joe and Jack show us that the danger of pinball goes beyond the corruption of youth. 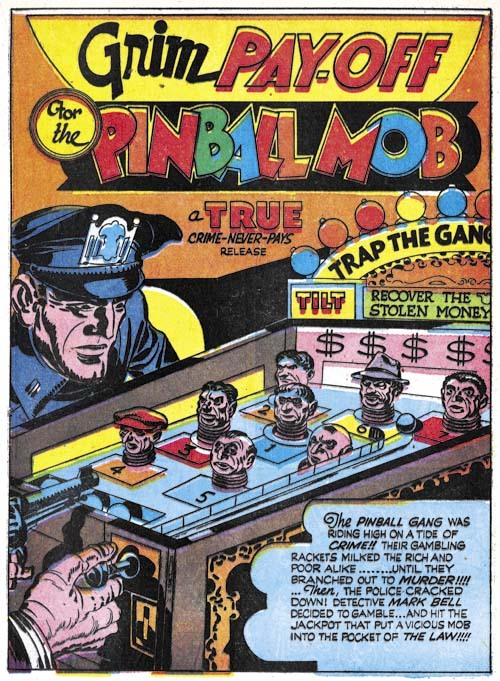 There is irony in Simon and Kirby’s voicing their concerns about pinball at the same time that many in the public were complaining about the danger comic books, and in particular crime comics, presented to the nation’s youth. Did they really see pinball as a corruptive danger? Or were they just trying to divert attention away from comic books? Pinball games continued in spite of the ban imposed by many communities. 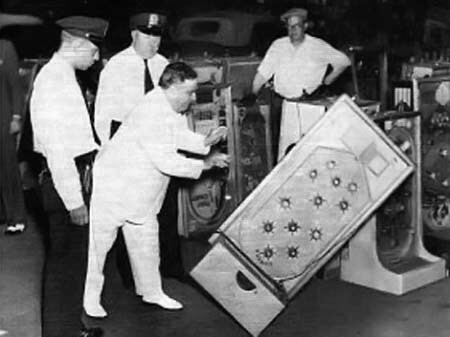 New York lifted its pinball ban in 1976. The City Council did so largely because Roger Sharpe demonstrated that pinball required skill, not luck. He proved this playing a game where he announced that he would land the ball in the middle lane and proceeding to do just that. After that pinball flourished in New York. The pinball industry did quite well at the time driven by the digital age. But in the end home computers and video games brought about a severe decline in the pinball industry. I have not been able to find any company that is currently making pinball machines. With no more pinball games I guess we can say that they no longer present a danger to today’s youth. 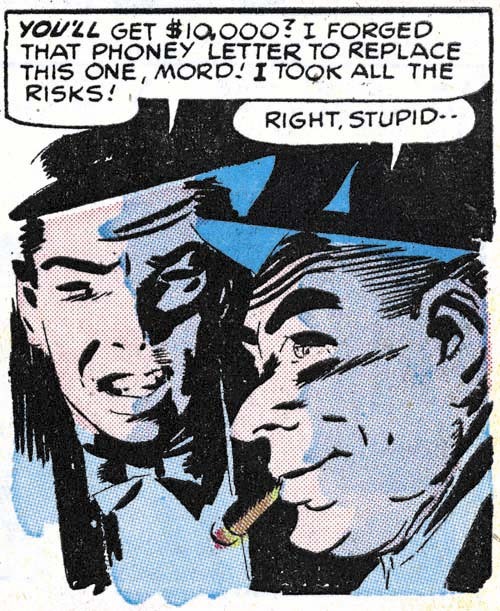 Mort Meskin was the most important artist in the Simon and Kirby studio, second only to Jack. But he did important comic book art before and after his stay in Joe and Jack’s studio. Mort often inked his own work and he was a talented inker. Inking of Meskin’s pencils are generally fairly light. That is overall there are significantly more white or colored areas in a panel as compared to black ones. Now there are exceptions such as panels displaying night scenes. But look at the splash for “Fireworks on the Fourth”. Lots of black and since the actions occurs indoors there is no reason that so much blacks had to be used. To my eyes, the inking in “Fireworks on the Fourth” seems to flatten the image. 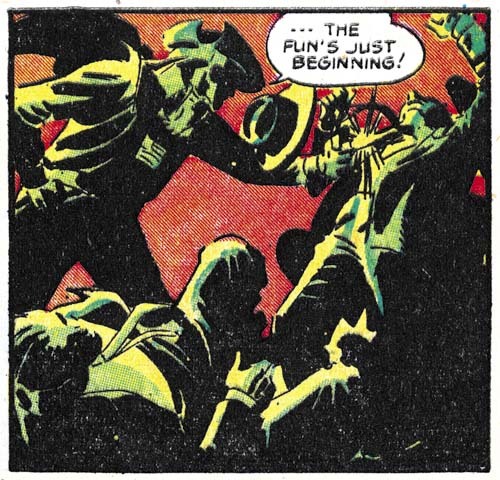 This may not have been an accidental effect as Meskin’s comic book art often exhibited a narrow depth of field. But let me digress. During the war years there was a flood of patriotic superheroes published in comic books. Of course all superheroes in American comics would be expected to be patriotic. By patriotic superheroes I am referring to those with a costume or a name that distinct patriotic overtones. With so many patriotic superheroes it must have been difficult to come up with an costume that was appropriate and original. Most had a costume based on the American flag with the most famous examples being MJL’s Shield as well as Simon and Kirby’s Captain America. But that was not the direction taken by Standards for their Fighting Yank. This hero had a costume based on the type of clothing used during the Revolutionary War. Not that the flag was neglected; it appeared on the Fighting Yank’s chest. I am not sure if the Fighting Yank was the first to use the Revolutionary War theme but in any case there were others as well. Since it really was not that spectacular of a costume one might think the Fighting Yank would have been one of the less successful patriotic heroes. But actually he did quite well lasting from November 1941 (Startling Comics #10) to August 1949. It really was a long run since most superheroes, patriotic or otherwise, did not last nearly as long. The last issue of Fighting Yank was #29, the very one with Meskin’s interesting inking. The inking has a greater emphasis on black than normally used by Meskin I still feel that he did the inking. While cloth folds are blocky they still exhibit the long sweeping curves that Mort preferred. When inking such folds Meskin typically used multiple brush strokes which he sometimes overlapped. This inking technique is often revealed by looking at the ends of the cloth folds were sometimes the separate ends of the individual strokes are reveals. This can be seen here are for example inking of the man in the blue suit on the left side of the splash. In Steven Brower’s recent book on Mort Meskin (“From Shadow to Light”) Jerry Robinson remarked that to keep things interesting he and Mort would often varied how they created the art. I think that this inking technique is an example such a practice. Meskin put this new inking style to good use. In the panel shown above he uses a low light source to provide dramatic lighting. This is something he rarely did when he later worked for Simon and Kirby. While Mort’s inking is the basis for the image’s drama, the colorists use of a light violet shadow greatly enhances the effect. The use of two color tones on the face is uncommon in golden age comics. It is pretty rare, but not unknown, in Simon and Kirby interior art where generally colored areas are separated by the line art or isolated in white areas. The colorist did not limit his use of multi-tone coloring to simple shadows but he also often put them to dramatic effect for scenes meant to have low light levels. Certainly the most spectacular of these multi-tone panels is the one from page 3 that is shown above. The combination of an orange background and the yellow to green toned figures is just stunning. The combinations of Meskin’s great pencils and his unusual inking along with the colorist efforts combine to make this an unforgettable piece of comic book art. One might be tempted to credit such exceptional coloring to Meskin himself however other Standards comics should be checked for multi-tone coloring before such a conclusion is reached. Coloring of golden age comics was generally handled by the publisher and not the artist who did the original line art. Standard Comics may have had to fortune of using one of the more talented colorists in the business. 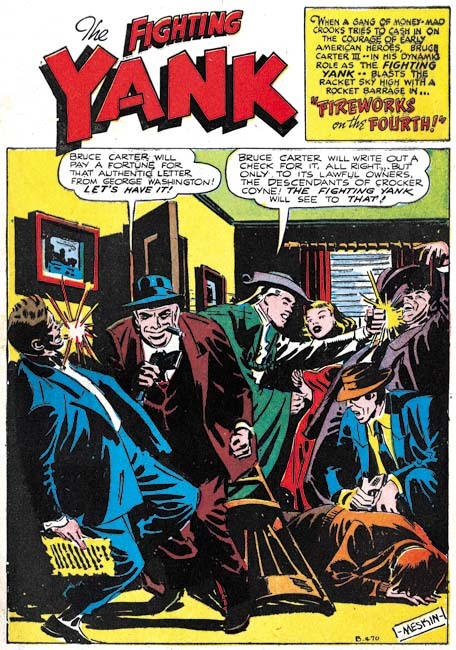 Simon and Kirby tried to vary the type of crime that was portrayed in their stories. But of course they could write very different stories that deal with the same type of crime. So there are multiple gangster, western outlaw and other stories. But there was one crime category that Joe and Jack only dealt with once in their crime comics, treason. It probably should not be surprising that treason was so rarely featured in the stories. After all it is not what one normally comes to mind when you think of crime. What is truly odd is that it was not treason against the United States that Simon and Kirby wrote about but against England. For “Burned at the Stake” is about the failed attempt by Guy Fawkes and others to blow up the English King and his parliament. Perhaps the reason Simon and Kirby selected this story is that Guy Fawkes seems to have generated the greatest public reaction to a traitor. Sure everyone in America knows of Benedict Arnold but when was the last time he was hung in effigy? In England Guy Fawkes’ effigy has been hung and burned on November 5th for the last 400 years! 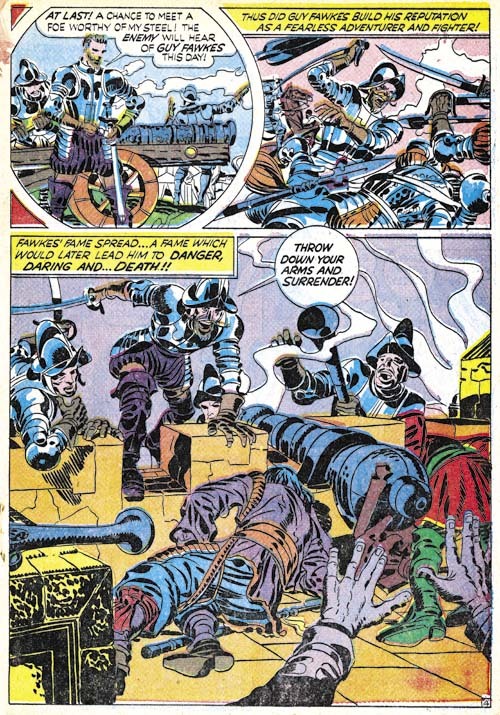 While Simon and Kirby’s version of the gunpowder plot is relatively accurate, it completely leaves out the religious background. There is no mention of the Protestant faith of England’s rulers or the difficulties faced by the Catholic minority. One might accept Simon and Kirby’s assertion that Fawkes went to Flanders to seek glory, but only religion would explain why he joined the Catholic Spanish side against the Protestant Dutch Republic. As Simon and Kirby present it, the leaders of the plot objections to King James I seems based on little more than personality. Also there appears to be no explanation for Guy Fawkes’ joining the plotters other than something akin to a lark. Some understanding of the religious issues is needed to make the whole story comprehensible but nowhere is that subject mentioned by Simon and Kirby. Joe and Jack’s handling of Guy Fawkes is very out of place with the treatment typically reserved for traitors. Fawkes is by no means a sneaky or cowardly villain but an individual to be admired, even if reluctantly. When discovered by the King’s guards, Fawkes puts up a valiant but unsuccessful fight to avoid capture. Afterwards Guy refuses to reveal the names of his fellow conspirators even under extensive torture. The only glaring inconsistency is Fawkes’ gallows confession of guilt. Guy was said to have repented but since history is written by the winners one wonders how accurate testimony of that confession was. But this story is in a crime comic and American morality of that day required that “crime never pays” (which phrase Simon and Kirby conclude the story). I have previously discussed the double page splash for this story (The Wide Angle Scream, It’s a Crime). Until recently Guy Fawkes has not occupied much of a place in the American conscious. That is not true for the English, I once worked with a lady originally from England who despite being Catholic took part in November 5 celebrations. However Americans were re-introduced to Fawkes through Alan Moore’s graphic novel “V for Vendetta” and the movie based on it. After the failure of Stuntman and Boy Explorers for Harvey Comics, Joe Simon and Jack Kirby began looking for a publisher that they could produce comics for. They eventually made a deal with Prize Comics where they converted the existing Headline Comics from a superhero to a crime title. The first crime issue was Headline #23 (March 1947) and it is packed with great stuff. Full of material all drawn by the dynamic Jack Kirby. The premise, at least initially, was that Headline would consist of true stories often presented by “Red Hot” Blaze. One of which was “To My Valentine” the story of the St. Valentine’s Day Massacre. The story as presented by Simon and Kirby starts with a dramatic full page splash. Cupid with a machine gun having just finished mowing down a line of men. It seems at least one of them had a handgun so it can be presumed that they were criminals. Text presented as a scroll informs us about the war between two gangs one headed by Al Capone and the other Bugs Moran. 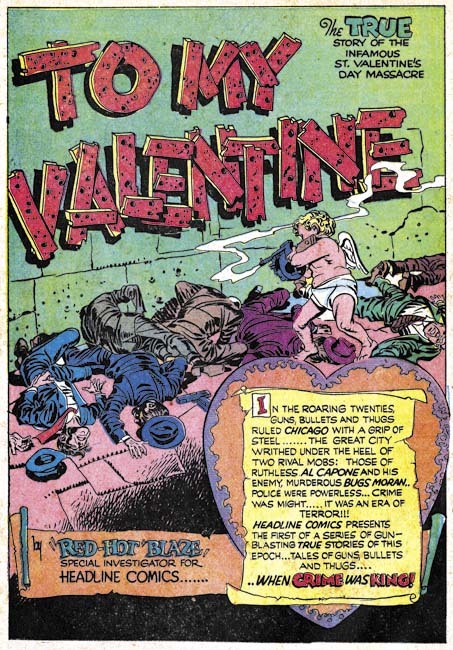 The first story page depicts a man discarding a Valentine Day card and then abusing the store’s proprietor when he asked to be paid for the damaged card. An odd start for a crime story, but then again Simon and Kirby were always very original in their story telling. This beginning indicates the story is taken place on Valentine’s Day and introduces the reader to the thug-like nature of the man. On the next page the readers follows the man to his arrival to a group of gangsters as they prepare for some undisclosed criminal activity. Only they become interrupted by the appearance of some uniformed policeman. Or rather as is revealed in the last panel, as members of the “other mob” dressed up as cops. Page four has the arrival of boss and massacre of the apprehended gangsters. Pretty dramatic stuff. But interestingly nowhere is either gang mentioned by name. The reader will learn later that the victims belonged to Bugs Moran gang but the name of the leader of this particular confrontation is never revealed. While some of the facts about the St. Valentine’s Day Massacre are well known the perpetrators have never been positively identified. Page five introduces “Red Hot” Blaze as he bridges the story from the massacre to the arrival of a reported to interview a prison inmate. Only the reporter finds out that the inmate is out, not on bail but for a stroll. The reporter does not wait for the inmate’s return as he already has a great story for his newspaper. The reporter returns later to interview the prisoner only to be roughed up by the inmate right in front of the sheriff. When the reporter objects to the treatment he has received the sheriff responds he did not see anything. “Red Hot” Blaze describes the story as an example of the corruption in Chicago at that time. Still this sub-story seems only remotely related to the rest of the Valentine’s Day Massacre story. It takes up two pages, as much room as the massacre itself. Why did Simon and Kirby include it? Page five ends with Bugs Moran hearing about a party the other gang was having and on the final page of the story we find Bug’s gang performing their own massacre at their rival’s party. This was supposed to have taken place at the Manning’s Hotel but a Google search fails to come up with any mention of Bug’s revenge. Just another thought cousins! … it isn’t hard to give crime another boost to a new heydey … Those who play ball with the black market boys and their like are only giving a new ‘go-signal to mob rule! Don/t encourage them … you’ll pay a higher price later!!! Here Simon and Kirby reveal the story’s real theme and the explanation for the sub-story of the newspaper reporter from Chicago. “To My Valentine” is not just, or even primarily, about the gang war between Al Capone and Bugs Moran. Rather the story is concerned about the corruptive influence of organized crime and the dangers involved in supporting it. The years immediately following War World II were prosperous especially when compared to the pre-war depression period. But although many were now earning good incomes the country’s industry as a whole took some time to re-tool from the production of military goods. People had money but could not always spend it on the goods they wanted. Under such conditions a black market sprung up (or rather continued from the war years). Here Simon and Kirby are warning about the possible outcome of supporting the black market and allowing it to prosper.